There’s no doubt coping with the death of a loved one is one of the most difficult experiences a person will ever have to endure. Along with the emotional pain associated with a loved one’s passing comes the stress of attempting to organize a funeral. While there are few things that can instantly provide emotional solace during this time, a funeral planning checklist can help with the burden of planning and organizing the final celebration of life. Funeral costs can be extremely expensive these days, but the funeral planning checklist available on this page can be downloaded for free. Get the funeral planning checklist from Microsoft by clicking the link. The funeral planning checklist from Microsoft is designed to help you keep track of critical information as you are making plans for a funeral. 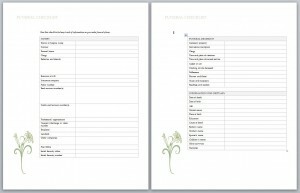 The funeral planning checklist is broken in to two pages and is extraordinarily easy to use and understand, making it an amazing helpful tool during an incredibly difficult time. Once the respective party has been notified or an effort has been made to contact or reach out to the party, simply mark the corresponding box. The second page of the funeral planning checklist is reserved for “Funeral Decisions” and “Information for the Obituary.” In the “Funeral Decisions” you will keep track of things such as the cemetery property, gravestone inscription, clothing for the deceased, pallbearers, flowers and florists, and readings and readers. When filling in the “Information for Obituary” category, it’s important to remember the date of death, date of birth, age, marital status, place of birth and cause of death among other things. The obituary is the final written word on your loved one, so it’s critically important not to leave anything out. Often times there are few words that can be said to soften the blow that accompanies the loss of a loved one. The funeral planning checklist is designed to make the planning of properly saying good bye a little less taxing.